PROFESSIONAL WATER GUN FOR CLEANING SPECIMENS NEW! 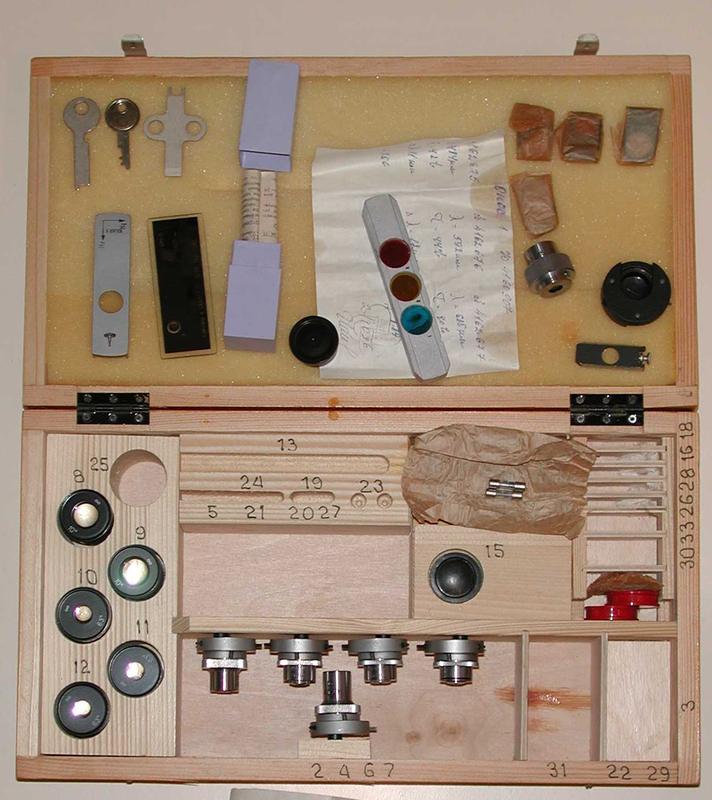 Why spend a fortune in time and money cleaning your specimens? 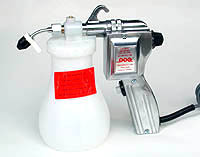 Use what the professional use: a high-power water gun that will clean, de-scale or otherwise refresh your samples! Our units develope a full 1650 psi water pressure in a hand-held gun, equipped with a superior, fully adjustable nozzle and pressure intensity dial. 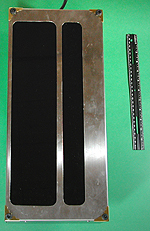 Full metal casing on the handle makes these sturdy units virtually indestructable, and the special reservoir can handle strong solvents as well. Simple 110V plug-in unit, full one year parts and labor warranty @ only $259.00 plus shipping! NOW: An overseas unit built for our European clients with 220V is in stock @ just $269.00 plus shipping! 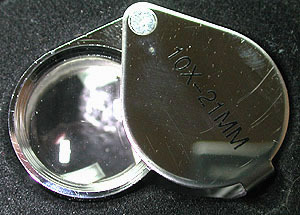 10x Loupes - These loupes have glass lenses with metal cases, providing good 10x magnification with a 21mm field of view. 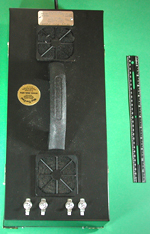 Superior to anything on the market in this price range @ just $10.00 each, FOB our warehouse. 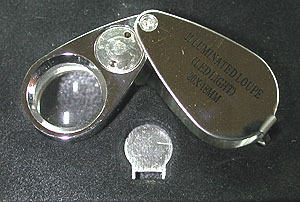 20x Illuminated Loupes Similar to our low cost 10x loupes, these are glass lenses with metal cases, but providing good 20x magnification with a 18mm field of view. The unit has an internal bright LED light with an ON/OFF switch, solving the typical problem of low light at higher magnifications that require shorter working distances. A great tool for the field or home lab far superior to anything on the market in this price range, with battery and battery tool included! @ just $20.00 each, FOB our warehouse. Raytech Versalume 4 - This is a 4 watt long & short wave portable UV lamp that operates on either AA batteries (not included) or on a 110V AC transformer that we supply for plug-in use at home. The unit employs Raytech's exclusive lifetime filters that provide better than 30% more output than competing manufacturer's units, and each Versalume also includes Raytech's "Story of Fluorescence" book!Unfortunately, 110 V units are no longer available. 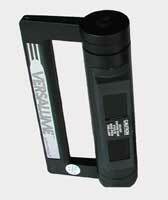 230V units for overseas use available @ $129.00, FOB our warehouse! SOLD OUT! Raytector V - This unit is a 12 watt (6 watt LW+6 watt SW) long and short wave portable UV lamp with a lifetime internal rechargeable (plug-in) battery as well as a 110V AC transformer for home use. The wavelengths are selectable (LW only, SW only or both together), and Raytech's lifetime filters are included as well. These units provide superior output, and a 24hr. battery charge will provide up to 7 hours of field use! These are the top of the line of portable units and are in stock for immediate shipment. 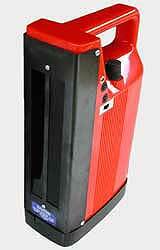 We only have the 230V units available @ $336.00, FOB our warehouse, as Raytech no longer manufactures the 120 V units. SOLD OUT! Model 88 Superstar - A superb, AC-use-only unit with extraordinary output and exceptionally large filter area (the most costly part of any UV lamp) that delivers equivalent output of two ordinary lamps! The expert's choice, selectable wavelength use, tough enamel and anodized aluminum case. 110V units are no longer available. A few 230 V units available at $449.00 - please inquire for shipping costs! SOLD OUT! 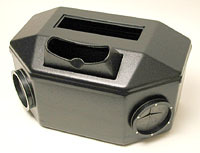 Custom View Box - designed and fitted for the Model 88 (above), provides excellent light-shielded UV examination of samples. Lamp attaches and removes effortlessly. Tough finish will last a lifetime! Price: $259.00 plus shipping. SOLD OUT! A powerful new unit from Way Too Cool, an exclusively midwave 25 watt dedicated unit for maximum midwave output, a cabinet-style lamp meant for use in larger displays, and a great companion lamp if you already have a LW/SW unit. The unit is fan cooled and a wonderful, 110 volt single wavelength display unit @ $545- net plus shipping and insurance. If you want to add a high-end midwave unit, this is it! The largest multi-wave lamp we handle, this superb Way Tool Cool cabinet-style lamp is meant for use in large displays, with a full 36 watt output for both LW and SW ultraviolet, plus a 25 watt midwave included as well!! Fully wavelength selectable, fan cooled, a monster 110V display lamp @ $860.00 OUT OF STOCK! 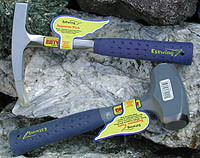 Estwing Prospecting Tools- - The full line is available for factory-direct shipping. A sampling of typical tools includes four different chisels, priced at 24.75; five different rock hammers and heavy duty crack hammers, priced from $41.95 to $49.95; gad pry bars at 54.95; hoe picks @ $89.95; safety goggles, etc..are also available. Inquire for specific details. All items FOB our warehouse, prices subject to change. 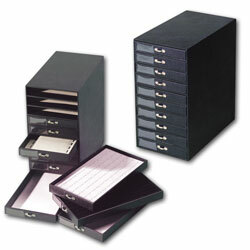 Micromount Cases - These are rather handsome, multi-drawer cabinets suitable for micromounts and small samples, offered here at a price far below typical wooden cabinets. 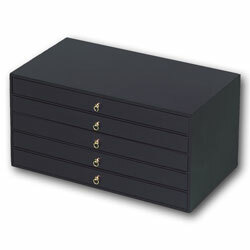 They are constructed of heavy duty fiberboard with a dense, black leatherette embossed covering, and a brass colored metal drawer pull is included with each drawer. These are sturdy and make for a long-lasting convenient storage cabinet ideally suited to micromounts. Each drawer measures about 14.25" wide x 7.75" deep and just under 1.25" high; a five drawer unit will hold nearly 500 standard mounts; the ten drawer unit will hold nearly 1000 micros! We can quote accurate shipping charges to your destination - please inquire! See our page of Ordering Instructions for shipping and payment information, as well as our Index at the left for other products. If you are an active field collector, let us help you identify your unknowns with our exclusive Analytical Services, using non-destructive Scanning Electron Microscopy and Energy Dispersive Spectroscopy. 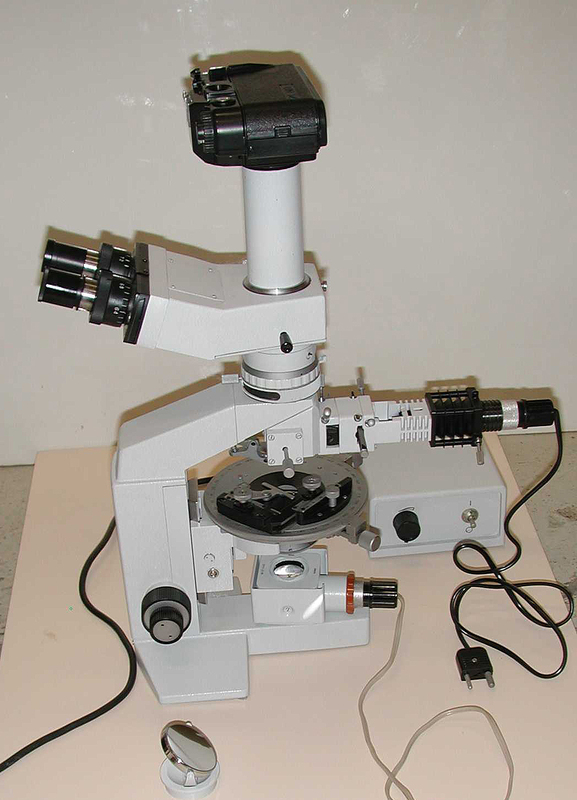 If you need a good microscope at a great price, see our Microscope page, too!